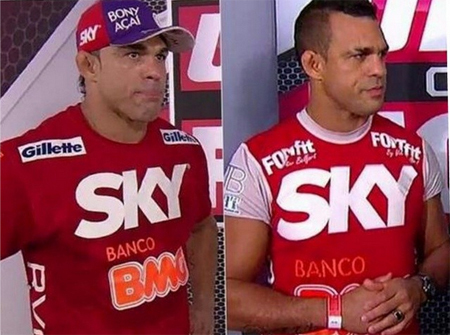 Vitor “The Phenom” Belfort (pictured) has looked anything but phenomenal recently. Perhaps that’s because he’s a TRT-less 39-year-old competing in a young man’s sport. After getting dusted by Kelvin Gastelum on Saturday, Belfort’s fourth TKO defeat in his past five outings, including three straight, the Brazilian announced his next fight will be his last. It’s not as though Belfort wants to retire. Seconds after announcing his swan song, Belfort was pushing for the UFC to establish a “legends league” for oldies to fight against each other instead of youngsters. Someone should tell Belfort there’s already an organization that does that, it’s called Bellator MMA. Belfort started his controversial MMA career back in 1996, so he is a true pioneer of the sport. Although he captured a UFC light heavyweight title along the way by beating Randy Couture, only to lose the strap to Couture in his next outing, Belfort’s legacy will be defined more for his use of testosterone replacement therapy (TRT). Belfort certainly wasn’t the first and only fighter to use TRT, but he became the poster child for it because of the successes he enjoyed and rewards he was gifted during the twilight of his career. He has never disclosed exactly when he started taking TRT, but his body of work, and his body itself, might provide the answer. After testing positive for elevated levels of testosterone in 2006, Belfort ignited a seven of ten run where he fought for two UFC titles in as many weight classes. While he came up short in both championship affairs, Belfort was still a top contender at the ripe old age of 35. He proceeded to string together three straight highlight reel victories against the UFC’s top dogs, which left many amazed at how Belfort had managed to turn back the hands of time. Then Belfort flunked a random drug test for elevated levels of testosterone and was forced to cop to taking TRT, and all questions regarding Belfort’s late-career resurgence were answered. Most MMA fighters would contest that TRT is merely a way of circumventing the system because it was legal under a doctor’s prescription – cheating without cheating, if you will. However, TRT is intended to bring a person’s testosterone levels back to normal ranges, and Belfort was above the legal zone so he was cheating. The fact that he was caught in a random drug test made it far worse for him. Belfort was pulled from his scheduled middleweight title fight against then-champ Chris Weidman at UFC 173 and the UFC banned TRT. However, the UFC handed him an instant crack at Weidman’s gold after living 15 months without TRT. The Brazilian claimed he had traded in TRT for TNT. Weidman couldn’t help but notice how … differently Belfort looked physically without the assistance of the synthetic substance. Belfort was not nearly as explosive or strong in his return bout against Weidman, which resulted in a first round TKO loss. Belfort managed to knockout Dan Henderson in his next fight, but Henderson, who had also consumed TRT during his career but never failed a drug test, had dropped five of seven entering the bout and should have retired many moons ago. “The Phenom” then looked every bit the part of a near-40-year-old who was no longer fueled by TRT in landslide TKO defeats to Ronaldo “Jacare” Souza, Gegard Mousasi and Gastelum. And that leads us to today, where Belfort looks ahead to his farewell fight and keyboard warriors like myself examine a 20-year résumé tainted with TRT and not entrenched with titles.